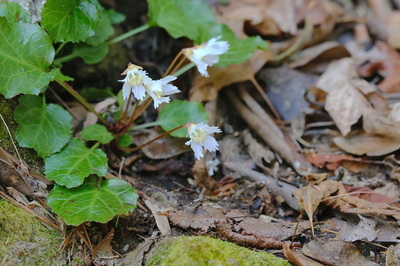 Shortia galacifolia (Oconee Bells), is a rare and beautiful wildflower first discovered in 1788 by the well-known French botanist, André Michaux, somewhere in the “high mountains of Carolina.” Michaux took a specimen of the plant back to Paris and preserved it in his herbarium, where it stayed, largely ignored, for half a century. In 1839 Michaux’s specimen, still unnamed, was examined in Paris by visiting American botanist Asa Gray, who recognized it as a new species and perhaps a new genus. Gray returned to America, and with other botanists spent nearly 40 years searching for the plant, without success. 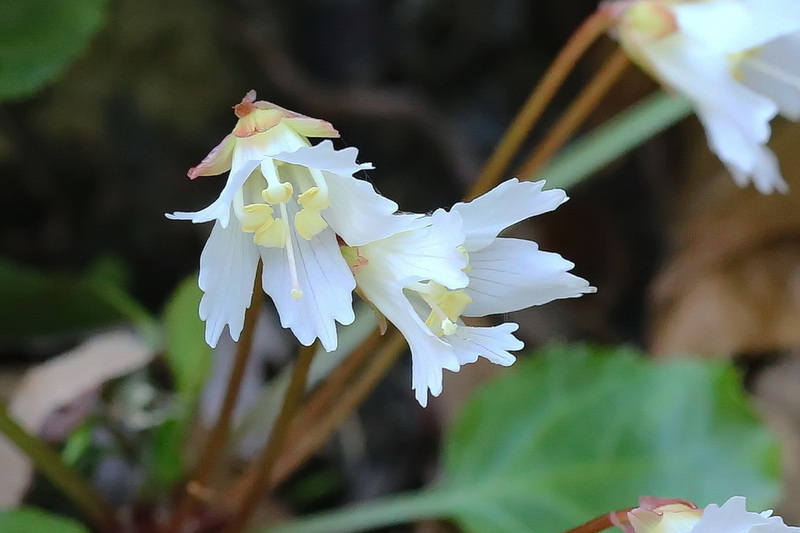 Shortia was finally “rediscovered” in 1877, not by one of the teams of botanists searching for it, but by a teenager named George Hyams, who found it along the banks of the Catawba River near Marion, NC. 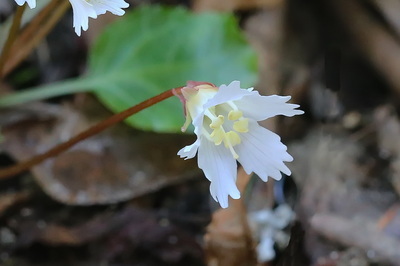 This specimen eventually found its way to a botanist, who notified Asa Gray, but another decade was to pass before it was finally found growing in the wild at the junction of the Horsepasture and Toxaway Rivers in South Carolina, not far from where Michaux first found it nearly 100 years earlier. Thus ended one of the great mysteries of American botany. Shortia’s restrictive germination requirements limit its natural range to a few watersheds in the southern Appalachian mountains. In the 1970s, the Horsepasture/Toxaway colony was about to be submerged by the rising waters of Lake Keowee, a new hydroelectric project then under construction in South Carolina. A “rescue” effort was organized, and some of the “rescued” plants were given to my wife Betsy. They are now growing happily on our property in Transylvania County, where the photographs below were taken. Shortia grows naturally in two principal locations, one in the Jocassee Gorges near the North and South Carolina border, and the second along the banks of the Catawba River in McDowell County, NC. The two populations differ sufficiently to have been designated separate varieties. 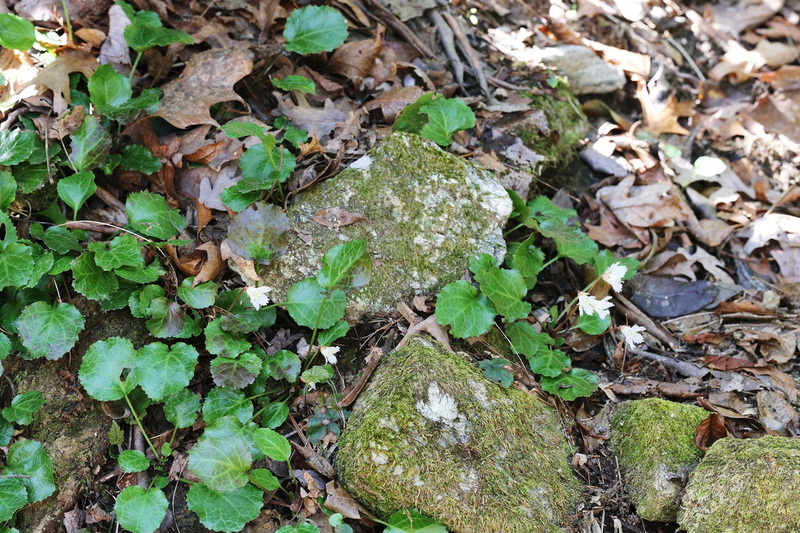 For a more complete discussion, see Sorrell, “Oconee Bells, Northern and Southern,” NCPedia 2014 (http://ncpedia.org/environment/oconee-bells).